Headlines Fishing has been good to excellent over the past week or so with some outstanding numbers and with water levels still rising in Eucumbene the fishing is going to get better as the water continues to cool. Don't forget we have 25% off virtually everything in the shop* at present. Sale ends 5:30pm Thursday 31st March. Rivers:- Nymphing has been a very good option with the cooler and cloudy conditions of late, though having said that some great fish have been taken using large and small terrestrials like hoppers, sywalla hummer and missy X dries. 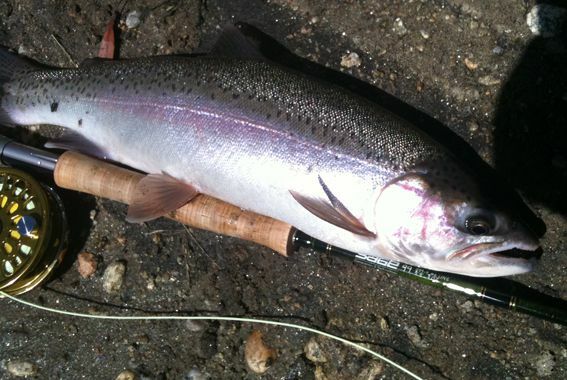 Some better browns along with some fat rainbows have been taken in the Eucumbene, Thredbo and Murrumbidgee systems. *Peter Vierod caught this lovely brown on a beadhead dropper in the Thredbo recently. A nice fish. Just a quick email to send you the photo of the rainbow I caught on the Thredbo Saturday afternoon. There were plenty of fish moving up river and a little bit later I was monstered by another fish about twice the size of this one. 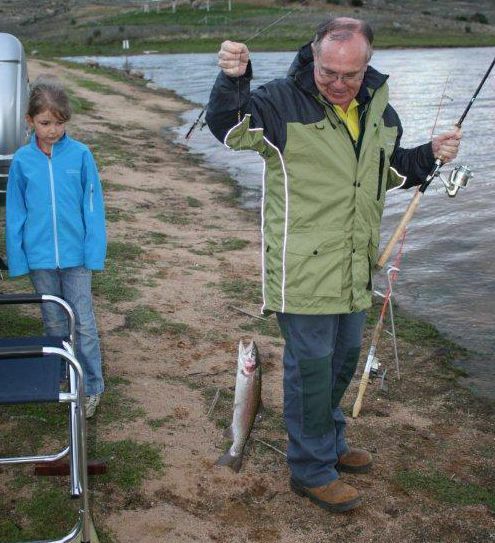 Lake Eucumbene:- Is fishing very well though most of the fish are small. Light rods and tippets will give you a bit more fun though you need to watch out for the thistles in the water. No real mudeye hatches to report at this stage. With the lake still coming up and into long grass thistle grubs have attracted plenty of fish in some areas. Most anglers have been doing well with small wets, nymphs and streamers or muddler and foam mudeye patterns on and after dark. Browns have been very scarce overall. The Angler's Reach area of the lake may be a better option for chasing these fish at present. Braemar, Buckenderra, Seven Gates and Cobrabald have been very good. *Bruce Robson caugh sixty fish for a week recently all on the one Wooly bugger. *Ivan Maric had a 25 fish session last week with beadhead nymphs doing very well. *Jaqui from Buckenderra reports that fly fisherman are catching dinner with Brown Muddlers, Black Beetle patterns, Stick Cadis, Yabbies and Woolly Buggers. Lake Jindabyne:- Jindabyne reports have been quiet but there have been a few reports of fish moving on top. Water temps have dropped a little to 18-19 degrees degrees celsius which will improve the fishing no doubt. *Keen spinner Craig Walden put his #2 Celta to good work in the Murrumbidgee and caught this quality 50cm brown. Great fish. Eucumbene:- Some good numbers of fish but quite a few small ones around. The Angler's Reach arm down deep with Rapalas is a good option for browns which appear to be moving up into the river mouth area already. Lofty's cobras flatlined, leadcored or on a downrigger have worked well in the Coppermine, Cobrabald and Waiunui areas this week with 48Y and 51 working well. Strike pro vibes in #221 have been great flalined early too. *John, Neil, Ray and Perce Doherty along with Richard Lee had a great week at Buckenderra, catching over one hundred and twenty fish between them. The overall majority of fish were released. Orange/Black, pink, and olive Tassie Devils were the best colours on the troll. A few fish were also taken on powerbait and fly fishing with Fuzzy Wuzzys. All fish were rainbows and of those kept 600grams was about the average weight. 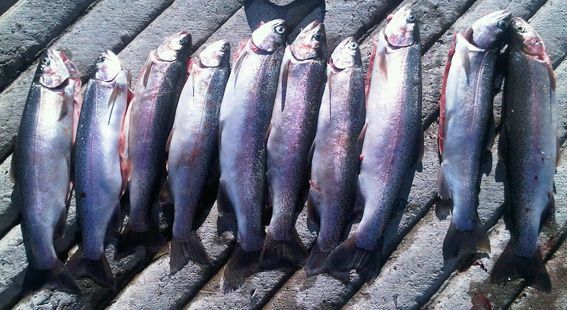 Jindabyne:- Some great trolling has been occuring on Jindabyne with some fantastic football rainbows and some very solid browns. Downrigging and leadcore or deep diving Rapala minnows have been most succesful. *Best report from the weekend was ten fish, a mixture of rainbows and browns to 1.5kg on Y82, 28 and 36 Dual Depth tassies. Waste point was the best area for this particular boat. Kalkite and the Islands have been productive areas to start too. As promised report on Jindy Sun and Mon. Plenty of fish on down riggers which I used in the main with plenty of catch and release .Caught a total of 32 with the only small ones being 3 salmon. All bar 4 on DRS. Tassie working best, any with lots of gold in it. Others catching a few on flat lines, there is a few fish feeding on the surface, including those kilo size rainbows at all times of the day and particularly in the wind lanes. The average weight was 1.2 kg. And they all fought well with plenty of aerials. It was nice to leave the lead core in the rod locker. Reports have continued to be great with fish being taken on mudeyes, scrubbies and grubs. Mudeyes under a bubble are the obvious best baits but also Powerbait is working well. Good reports have been coming in from Seven Gates, Buckenderra, Braemar and Cobrabald. We spent Friday night at <?xml:namespace prefix = st1 ns = "urn:schemas-microsoft-com:office:smarttags" />Hatchery Bay fishing with powerbait. Mark picked up a rainbow just on dark and we lost another later that evening. The remainder of the time was very quite though. Noticeably, there were large schools of fingerlings rising most of the evening.